Ho, ho, ho! I love the holiday season and all of the memories that come with it! I recently published a post, Christmas Bullet Journal Doodles. It’s been really popular and many of you have been emailing me requests for more holiday doodles. So below you’ll find even more fun to make doodles. 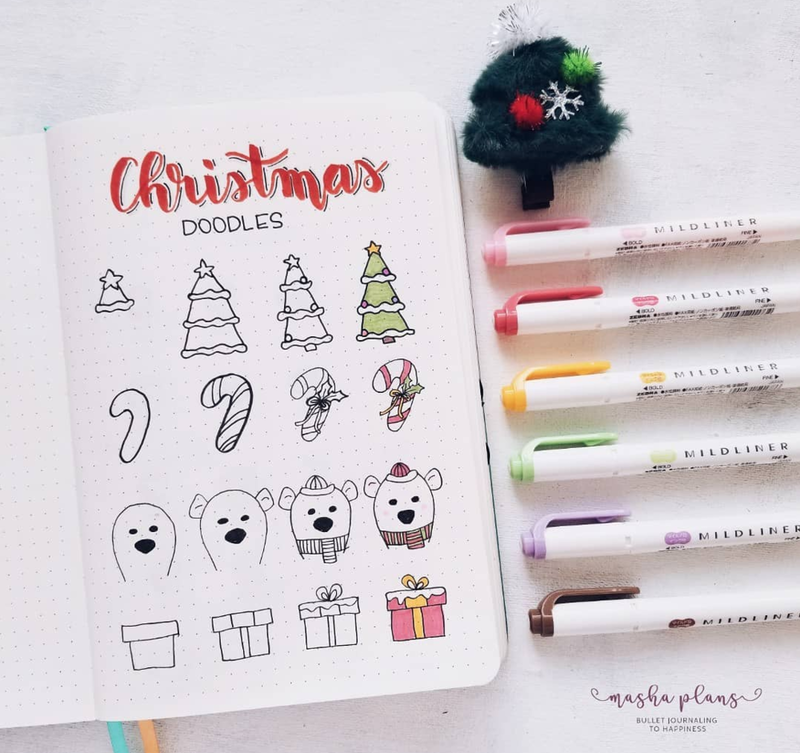 In addition to adorning your bullet journal or planner with holiday doodles, there are lots of other ways you can use them, too! Christmas is the most magical time of the year, so why not show it in your bullet journal! This drawing-filled spread shows lots of Christmas cheer from poinsettias to ice skates and lots of hot chocolate. How to draw holiday things. This step-by-step tutorial shows you how to make snowmen, wreaths, presents, Christmas trees, gingerbread men, and snow globes. Start by drawing them using a Sakura Micron Pen then fill in using colored pencils. Holiday wreaths don’t need to be kept only on the front door, use them in your bujo pages! In just a few steps you can make three fun and festive wreaths. Be sure to color them in with colored pencils for an extra pop of holiday cheer. Bring on the glitz! Simple snowmen go glam with glitter and colorful accessories. Start with a black marker to outline the snowmen, scarves, and hats, then fill them in with colored markers such as Tombow Dual Brush Pens and Elmer’s Glitter Glue Pens. This amazing Christmas page shows you how to make easy doodles such as candy canes, stockings, Christmas trees, holly, snowflakes, presents, and snowmen. Then, shows you examples of how to use them in your bullet journal. Draw them, then fill in with Faber-Castell Chisel Tip Double-Ended Art markers. Hey minimalist bullet journalists, these doodles are for you! Clean simple doodles give that minimalist vibe you’re looking for while bringing on the holiday cheer. Rudolph will love these portraits! Lifeinabujo breaks down how to make reindeer. What I love is that she gives you the perfect proportions in a dot journal. After following this easy tutorial, you’ll make reindeer all over your planner or bujo. Joyful doodles with simple steps! Create your own present, holly, Christmas tree, snowman, ornament, candle, and candy cane. Outline it in black, then fill in with red, green, and gold markers. Take your doodles to the next level with these easy-to-follow drawings from mashaplans. Use a Sakura Micron Pen to draw the outline of a Christmas tree, candy cane, bear, and present. Then fill them in with Mildliners. Hello candy cane lane! This festive bullet journal spread features trees, lights, icicles, wreaths, snowflakes, bows, stockings, candles, mistletoe, hot chocolate, santa hats, and stars. Make your own holiday spread or use these ideas to decorate for Christmas around your house. Check out my resources page to see more of my favorite tools for bullet journaling and planning. Do you “doodle decorate” for the holiday? If so, how do use use them? Leave me a message in the comments below!